Not eating your vegetables? Not a member of The Clean Plate Club yet? Better hope the parents don't pull a page out of the Modern Times guide. Charlie Chaplin was the first true king of comedy on film. Sure his movies are silent, but all you need to do is watch in order to laugh until your sides hurt. Unfortunately I couldn't find a clip that wasn't messed with, so you must endure the Blue Danube Waltz as the slapped on score here... To get the true pleasure, go back to the original and watch MODERN TIMES (recommended viewing). 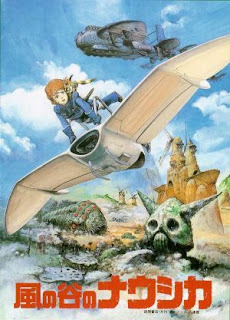 NAUSICA OF THE VALLEY OF THE WIND (1992) was the first film of Studio Ghibli (even before they were Studio Ghibili!). It's got everything in it, from the first seeds of steampunk, robots, a great female youthful heroine, and an environmental message (plus another one of how aggression is often a cry for love...). We've watched it numerous times, have the figures, and our very own pet fox-squirrel. The greatest animation company ever, Studio Ghibli, produced this fantastic movie in 1992. You can tell the makers of OVER THE HEDGE watched it but, boy, does their movie stink in comparison! 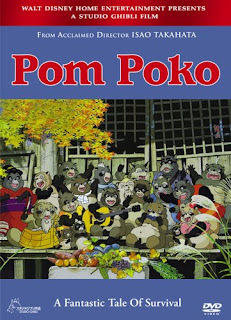 They missed all of the fun, ideas, and greatness of POM POKO. Being a Racoon was never so much fun -- nor was pranking the humans. It's a great tale of resistance and rebellion. There's a couple of spooky sequences and you can see the creatures' private parts, but still we think it's appropriate for age 6+. Lee Seong-kang's MY BEAUTIFUL GIRL MARI (2002) was one of our great film discoveries this year. The animation is beautiful and inventive. It's the story of a young boy who seems to have everyone around him always leaving him. He seems to find a solution by entering a dream world, where he meets Mari. Seeing it's set during his summer vacation there's no better time to watch it than right now. We'd say appropriate for age 7+.